Many lightyears from Earth, Dellian and his clan of genetically-engineered soldiers are raised with one goal. They must confront and destroy their ancient adversary. The enemy caused mankind to flee across the galaxy and they hunt us still. If they aren't stopped, we will be wiped out - and we're running out of time. 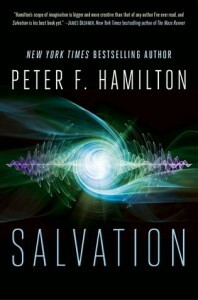 Salvation is the first title in a stunning science fiction trilogy by Peter F. Hamilton." "Interstellar war is a fantasy. It makes no sense. Economically, for resources, for territory...it's all crap. Hong Kong doesn't even make drama games about it anymore."